Do you remember your own school days? A 30 minute periods that seemed to go learning on for hours, with the teacher droning on from an open textbook, the monotony relieved only by even more ‘copy-paste’ work from the chalkboard into our notebooks? Life in the 21st century requires our children to have global perspectives, to be adaptable and open-minded , to have analytical, creative andÂ problem solving skills, and above all, to be lifelong learners. The life and work skills that our children require as they find their place in the world in a rapidly evolving global scenario, means that we cannot continue to teach with the same “chalk and talk” approach that has become synonymous with traditional schooling. In the contemporary educational scenario, the difference between the teaching methodology of national and international schools reflects both their respective visions of their learners and the objectives of their educational programmes. 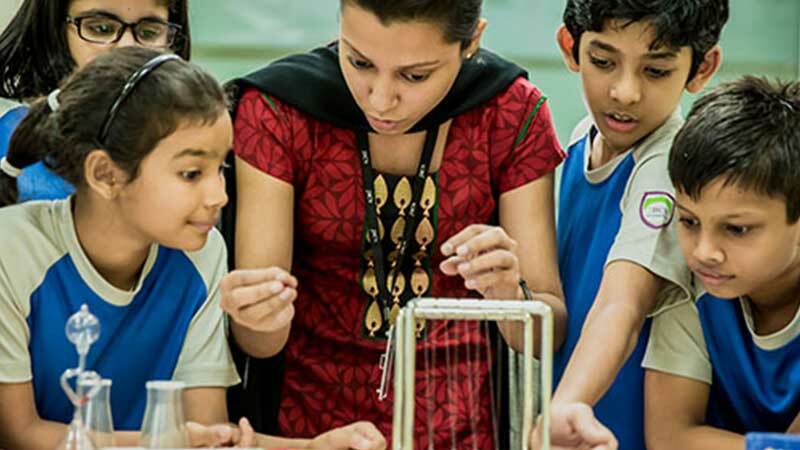 Teaching-Learning MethodThe fundamental shift in teaching-learning methods between national and international schools involves a move from rote learning to concept based learning. The goal is to explore both the breadth and depth of concepts, with a focus on deeper understanding, and then to translate that understanding into evaluation, synthesis, application and creativity. No longer is it considered necessary to memorize every page of a text book and then provide evidence of ‘learning’ by reproducing it verbatim during a 2-hr examination. So how do international programmes attempt to achieve this? The pedagogy involves experiential, ‘hands on’ learning through activities that help learners inquire, discover and deduce. The approach to learning is child-centric and encourages customization, taking into account the various multiple intelligences and learning styles of children in the classroom. Learners are encouraged to ask questions and seek clarifications and also to pursue their own lines of inquiry in areas of their interest. In fact, at JBCN, a planned strategy to teach research skills empowers children to find out things on their own, rather than depend on parents to execute their projects and other research tasks. International pedagogy also aims to help children make connections in order that learning is more permanent and meaningful connections are built between subject areas, between concepts, and to real-life as well. The idea is a horizontal integration of curriculum, which makes learning interdisciplinary, and helps children to see the connections between different ‘subjects’ and conceptual areas. For example, a thematic unit at JBCN based on the Solar System, includes mathematical estimations and calculations on planetary distances and dimensions, an understanding of the scientific forces that govern planetary revolution and rotation, understanding why earth is uniquely structured to support life, creating a paper Mache model of the Solar System in Art class. The list goes on. Include a field trip to the Planetarium and an Astronomy Night with a visiting guest speaker helping kids to identify night-sky constellations, and you have the perfect recipe for an enriching, rewarding unit that turns kids into Solar system scientists. International programmes lay a great deal of emphasis on collaborative learning and lots of group discussions, paired work and collaborative projects ensure that children construct knowledge and work together, respect each other’s ideas and opinions, and learn to harness each other,s skills cooperatively towards achieving a common goal. At JBCN, we also ensure that the real, ‘outside’ world is brought into the classroom so the children can clearly understand how learning in school applies to the way the world works outside of school. From film-making and archaeology workshops, to learning first-aid as part of a Human Body unit, from a classical dance demonstration to jiving with a jazz quartet, from discussions with a sparrow conservationist toÂ a Character Parade where each child represented a mythological character, our children enjoy a range of learning activities that brings alive the curriculum. Most importantly, their joy in learning ensures that they are fearless and enthusiastic ‘lifelong’ learners who view learning with happy anticipation rather than anxious trepidation.